In Ireland, the townland is the smallest unit of land division. They pre-date the Anglo-Norman conquest (source). What I find amazing about them is how prevalent their use is to this day. Where I grew up in Kerry, they are still used, day-in, day-out to give everything from directions to advertise property and house sales. I find this fascinating; what also amazes me is the number of discussions that occur among friends and in the community regarding townlands and their exact boundaries. Until the OSI released the below dataset, any disputes on the boundaries would have to be resolved using someone’s copy of maps from the 19th Century. It is great to be able to solve these using accurate data. There has been an OSM project ongoing with a few years to map all the townlands of Ireland. The Ordnance Survey of Ireland released the townland boundaries as open data under a creative commons licence. There are no townlands for the cities of Dublin and Cork but they cover the rest of the country. 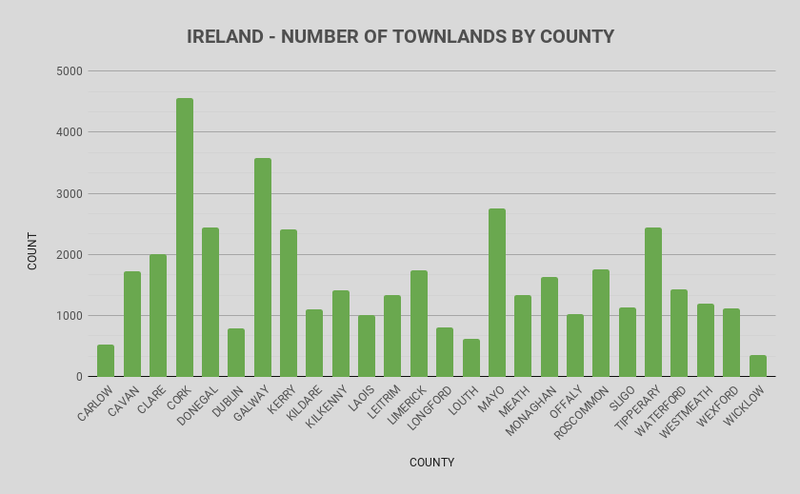 There are 50,380 townlands in this dataset. Because the ArcGIS Online viewer isn’t fantastic, I uploaded the townlands to Carto to view online. I have only uploaded the 50m generalised dataset as the ungeneralised dataset is ~240MB. Below is a Carto web map of the townlands of Ireland. I hope to do some work in the future on these townlands, such as general statistics and such.